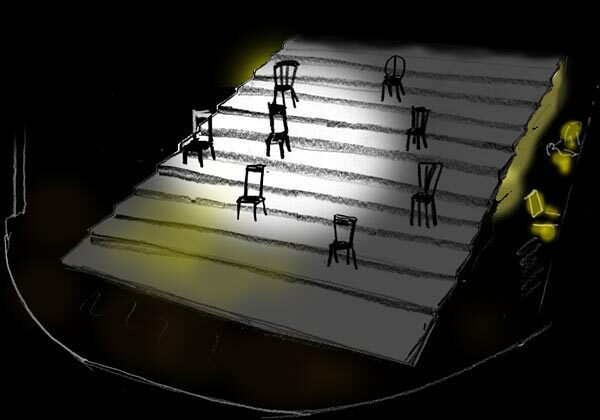 Sketch of the stage setting - A large stair with 13 steps was placed on the stage. When necessary doorways, iron bars and a hanging rope hung over it. Musicians played in its right side. 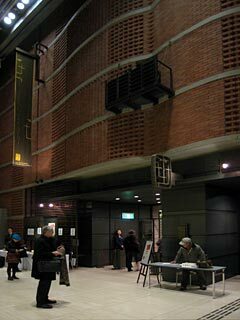 Recently I saw "Die Dreigroschenoper" (The Threepenny Opera) performed by Konnyakuza at Setagya Public Theatre. Die Dreigroschenoper was first performed in 1932 in Japan, only four years later than the world premiere at Theater am Schiffbauerdamm in Berlin. Senda Koreya (1904-1994) who played Mackie Messer at the Japan's premier was then staying in Berlin to study proletarian theatre and was among the spectators of the premier. Like other people in the Japanese theater world Senda Koreya was a "progressive intellectual" and a member of the Communist Party, and during his stay in Germany he joined the Germen Communist Party. Therefore, it was very natural that he was fascinated by Brecht's theatre and played an important role in introducing Brecht's works into Japan. The first performance of Dreigroschenoper in Japan was, however, not based on the authentic text and music but on the film made in the previous year by Papst. Enoken (1904-1970), a legendary singing entertainer in the 1930s, sang "Die Moritat von Mackie Messer". I presume that the original text and music were more or less copied, however they were performed in a strongly modified form. Nevertheless, Moritat must have become very popular in Japan. Otherwise I would not have already known the melody when I first listened to the song with original German text with a LP record at the house of a teacher of Goethe Institute in Kochel am See, Bavaria. Senda Koreya later founded together with nine other comrades Haiyu-za, one of the representative Shingeki theater groups (cf. this page). Haiyu-za often played Dreigroschenoper under Senda's direction. Not only Haiyu-za, but also many other groups in Japan took up the piece frequently. I checked the Internet and found that even recently almost every year a new performance of Dreigroschenoper finds its way to Japanese theatre scene, sometimes with top actors and actresses, famous singers and popular directors. The case of Konnyakuza is a bit different from such cases. Konnyakuza is an opera company founded by graduates of Tokyo University of the Arts to perform operas in Japanese language. Its Artistic director, Hayashi Hikaru (1931- ), is a composer graduated from Tokyo University of the Arts and worked in many occasions closely with Senda Koreya. Therefore, their Dreigroschenoper must be an authentic follower of the earliest performers of this work in Japan. I personally saw Dreigroschenoper in two occasions in the past, at Berliner Ensemble in 1983 and at Staatstheater in Wiesbaden in 2001. They were both performed in German and faithful to the original text by Brecht and music by Weill, so far as I understood. I expected to hear the original music at the performance of Konnyakuza, though the text might be transformed to some extent due to translation. Unfortunately I was greatly disappointed by the performance, because both music and text drastically deviatd from the original and I thought that the merits of the original were largely lost. Music was rewritten by Hayashi Hikaru and one anther musician, who for example added Okinawan taste to Moritat and other songs and created totally new songs with new texts here and there. Some people might find them tactful. But, I found the result sloppy and diffused. Most texts were freely created, independent from the original Brecht's texts. Apart from contents, I could not endure their style. They used halfway old-fashioned and colloquial words as if they wanted to pretend authors’ closeness to the mass people. However, they did not possess the power of expression in the original Brecht text. Not only music and text but the performance did not have enough power to convince the spectators. Maybe I might have been too much influenced by the German style. However, the action became too much Japanese, too much melodramatic. Therefore, the play also did not possess any spirit of protest against the authority. No harsh criticism against capitalism or social system. The whole story was reduced to trivial story of a villain. Yes, the word "villain" was repeatedly used, though it was not the intention of Brecht to focus on villainess of Macheath. A shnapshot with Gisela May, 10 years ago in Dessau. achieved even by Japanese people. In 2000, the 100th anniversary year of the birth of Kurt Weill, I had a chance to visit a concert by Gisela May held in Dessau. I was enchanted by her Brecht/Weill songs and candid tales. Her voice and singing style fit perfectly to the songs. 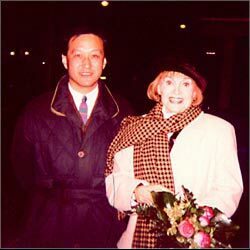 She embodied Germanness that was totally different from Japaneseness, which is softer and more youthfully feminine but lacks assertiveness and self-consciousness. Dreigroschenoper was the most popular play written by Berthold Brecht. But, it was not his best literary work, I believe. It was Weill's music that elevated Dreigroschenoper to the world fame. Nevertheless, Weill’s music is not properly evaluated in Japan and Dreigroschenoper is known first of all as a work of Brecht. The flyer of the premier in Japan did not mention the name of Weill at all. I believe that Weill's music is not properly evaluated even in Germany. A friend told me that this happened because Weill's music was categorized to U-Musik - entertainment music - different from classical music which was labeled as "E-Musik" - serious music - and no classical music critics took up Weill's music squarely. However, with the emigration of Weill and other leading musicians in face of the rise of Nazis, Germany and Europe lost their chances to develop "classical music" in right truck. Weill and other musicians could have linked high quality of music with its popularity. But, that did not happen and the classical music is now about to distinct. Am I wrong?